Will Senior Care Of The Future Be Our Home? | Full Circle Home Care Inc.
What if the majority of senior care could be provided in our homes? 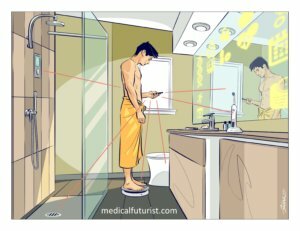 What if wearable and other devices could measure what needs to be measured in the bathroom or bedroom? What if smart clothes and brain activity trackers could change the way we stay active from home? Let’s see what types of technologies might transform our home to be the new clinic/hospital of the future for senior care. It could include a smart scale that measures weight, body fat percentage; recognizes you and sends data immediately to your smartphone. The mirror could be a digital one analyzing your stress levels, pulse and mood just by looking at you. It could present news related to these parameters. You could use a smart toothbrush that could analyze whether you are hydrated or not; and give rewards for spending enough time with that activity. Then in the toilet, there could be a little microchip for urine analysis. When you go into the shower, the smart home could bring the temperature down by using the smart device like Nest acquired by Google. Water quality and quantity, cardiac fitness and a bunch of other things simple devices could measure in the bathroom. It could include smart sleep monitors which first give you data about what quality of sleep you had and then it could wake you up at the best time to make sure you are energized in the morning. When you go to bed, the smart sleep monitor could let the Nest know it should bring the temperature down because you are about to sleep. Such monitors could include specific music and lights to make sure you are gently woken up. Pulse, pulse variability, breathing and oxygen saturation could be measured to reduce sleep apnea and snoring. There could be smart forks and spoons that either teach us how to eat slowly; or let people with Parkinson’s disease eat properly again. Scanners could measure the ingredients, allergens and toxins in our food and let smartphone applications help control our diet. There could be 3D food printers using fresh ingredients and create pizza, cookies, or almost any kind of final products just like what Foodini does these days. You could wear smart clothes measuring vital signs, posture, stress levels and brain activity telling us when exactly to change our daily habits for better performance. Services such as Exist.io could constantly look for performance tips by finding correlations between our digital habits and health parameters. We can use almost all these devices now and looking ahead into the future the best is just yet to come. The quest is to find those technologies that can really change the way we live our lives by bringing the clinical and hospital equipment to our actual homes providing better senior care without making the distance between patient and caregiver bigger. What would you like to measure at home? What do you think about the home becoming the clinic with medical equipment and devices measuring our vital signs and making our lives simpler and better allowing seniors to age in place?